The courtroom of the U.S. Supreme Court in Washington D.C. 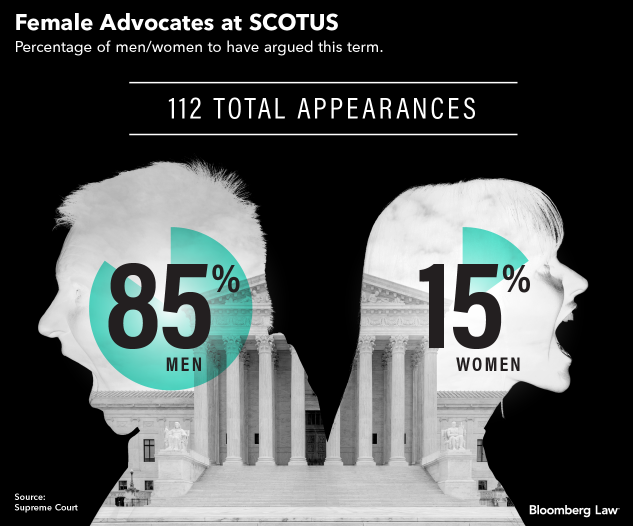 If a lawyer argued a case at the U.S. Supreme Court this term, chances are it was a man. An 85 percent chance, to be exact. The court is currently at the midpoint of its 2018 term, which runs from October to June. But of the 112 appearances made by advocates at the podium so far this term, only 17 were made by women. The 15 percent of appearances made by women this term are on par with recent terms, which has ranged from 12 percent to 21 percent since 2011, according to SCOTUSblog. Last term’s 19 appearances by women were the fewest of all those terms. Part of the disparity can be attributed to the fact that Supreme Court arguments are dominated by veteran attorneys—those that have argued more than five cases in front of the high court. Of this term’s 112 appearances, just over half—62—were argued by veterans, a group that is mostly male. Only 5 of the veterans who argued are women. Recently, there’s been a sharp drop in the number of women in the Solicitor General’s office—the relatively small office that represents the United States at the high court and, given the number of cases it’s involved with, serves as a springboard for Supreme Court advocacy. When Sarah Harrington, now of Goldstein & Russell, worked in the SG’s office, half of the 16 assistants to the Solicitor General were female, she said. Now there are only four, said Jaime Santos, of Goodwin Procter. The Solicitor General’s office did not immediately return a request for comment. Santos noted that one of those, Rachel Kovner, has been nominated to be a judge on the Eastern District of New York, which could depress the number even further. That’s a problem because all attorneys who spoke to Bloomberg Law for this story identified “feeder jobs"—like working for the Solicitor General—as one of the major obstacles to women appearing before the high court. “Most Supreme Court advocates have had similar work experiences on their way up"—a high court or appellate clerkship, a stint in the Solicitor General’s office, and time in a law firm Supreme Court practice, Harrington said. But these jobs have historically been held by men, Santos said. Currently, the solicitor general and each of the four deputy solicitors general are all men, Santos said. That’s been pretty much the case for years, with now-Justice Elena Kagan being the most notable exception. Kagan did a brief stint as Solicitor General before President Barack Obama nominated her to her current Supreme Court post in 2010. “That increased disparity will likely have ripple effects going forward as fewer and fewer women have the opportunity to represent the SG’s office at the podium,” Harrington said. Still, the future for female advocates at the Supreme Court “is bright—or at least brighter,” Latham & Watkins’s Melissa Arbus Sherry said. Sherry and Santos noted that that things may be looking up in the other feeder areas that will eventually lead more women to the top roles. Historically, only about 35 percent of Supreme Court clerks have been women, even though they comprise about 45 percent of federal appellate clerks , Santos said. For the first time ever, this term’s Supreme Court clerkship class is 51 percent women, Santos said. That’s in large part due to Justice Brett M. Kavanaugh, who hired the first all-female class of clerks for a high court chamber. If that trend continues, it could propel more women into the other feeder jobs and eventually to the Supreme Court podium, Santos said. And even though there was an exodus of sorts from the Solicitor General’s office, those women “have now entered or returned to private practice with years of experience at the podium,” Sherry said. That could increase the dearth of women coming from law firms. Currently only six of the 17 appearances by women this term were made by women from law firms. The other nine all came from local, state, or the federal government. In contrast, 45 men appearing before the high court came from law firms. To contact the reporters on this story: Kimberly Strawbridge Robinson in Washington at krobinson@bloomberglaw.com; Jordan S. Rubin in Washington at jrubin@bloomberglaw.com.